Lucky lass: Thulaasi and Suppiah sharing a light moment as they relax by the beach 10 years after the tsunami. PENANG - In early September, tsunami miracle baby S. Thulaasi dreamt that a giant meteorite plunged into the sea off Batu Ferringhi near her home in Penang. "It hit the sea just in front of my father's cafe. There was a big explosion, and the sea was filled with boiling lava," the 10-year-old recalls at a recent interview. Her dream shifted to another location where she saw shattered roads and burning cars as a result of the meteorite's impact. "I will never forget the terror I felt when the tsunami took her, so when she dreamt of the meteorite, it felt like it was a prophecy even though I knew it was only a dream," says 65-year-old Suppiah. "The two waves were about 3m apart and 1m tall. They made two white lines on the sea that stretched all along the shoreline. "About 10 minutes later, I saw a large wave in the distance. In seconds, it got closer and looked like a towering wall of water. I shouted for everyone to run but the tsunami hit before many tourists could even get up," he recalls. It also fractured Suppiah's hip, tore off the front wall of his shack, filled his bedroom to the ceiling with seawater and swept Thulaasi and her mattress out to sea. "The wave pushed my older daughter Kanchana (nine years old at the time), up to the hillslope. She held on to the plants there and suffered scratches. I couldn't find Thulaasi anywhere. Many tourists were screaming and shouting because they had lost someone, and I was getting frantic," he says. As the second wave reached the shore, someone on the slope above Suppiah shouted to him: "Your baby! Your baby is coming back!" "The second wave returned Thulaasi almost to the front of my shack. She was still sleeping on her mattress. I held her close and cried in relief. "I believe in miracles. I believe in God and divine intervention," Suppiah says emotionally. The Indonesian girl was swept away by the devastating 2004 tsunami and has been reunited with her family a decade after she was given up for dead, her mother said on August 8. Jannah and her seven-year-old brother were carried off when huge waves struck their home in West Aceh district on December 26, 2004. 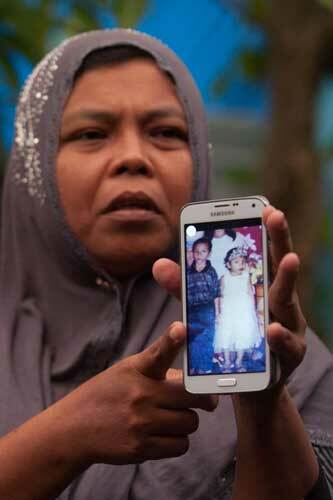 Indonesian mother Jamaliah displays a picture taken before the 2004 tsunami of her two missing children, daughter Raudhatul Jannah (R) and son Arif Pratama Rangkuti (L) in Meulaboh, Aceh province. Missing Indonesian tsunami victim Raudhatul Jannah (2nd R), aged 14, sits with mother Jamaliah (2nd L), holding youngest son Jumadi Rangkuti (C) and father Septi Rangkuti (extreme R), joined by Syarwani (L), the foster mother who has raised Jannah in the city of Meulaboh, Aceh province.